Gregory Meyer and Hal Weitzman reported yesterday at The Financial Times Online that, “Brad Lawrence has been farming for 40 years. Following his father and grandfather into the family business, he and his brother grow seed corn, soyabeans and peppermint on 6,000 acres in Knox, north-west Indiana. “The 57-year-old has seen his share of booms and busts in the agricultural markets, but with commodity prices soaring in recent years and land values at record highs, he says farmers are experiencing an unprecedented windfall. ‘This is the best we’ve ever had it, financially speaking,’ Mr Lawrence says. Meyer and Weitzman explained that, “The small family farm that holds mythic power in the US mind is less and less relevant as a component of the food supply. The majority of US production comes from the 2 per cent of farms with $1m or more in annual sales, USDA says. Medium and large farms reap more than three-quarters of government payments. “In real terms, farm income in 2012 is projected to decline slightly from record levels but remain the third highest in more than three decades. In more specific policy detail, the FT article pointed out that, “But even as direct payments are targeted, some are less comfortable with touching other programmes. Frank Lucas, the Oklahoma Republican who chairs the House agriculture committee, slammed the president’s plan to cut crop insurance. The FT article concluded by stating that, “Tom Sell, a farm industry lobbyist in Washington, says US farmers receive relatively less support than their peers in other countries. He adds that removing financial aid will hurt smaller, family farms and accelerate the move to industrialised, large-scale farming. An update posted yesterday at Farm Futures Online reported that, “As lawmakers on both the Senate and House Agriculture Committees look for budgetary and policy answers in preparation for the possibility of writing a new farm bill this year there are many unanswered questions. House Agriculture Chairman Frank Lucas, R-Okla., says his first concern is how much money will be available. Yesterday’s update added that, “Congressman Lucas says ultimately that if you go away from the old direct payment program and go to crop insurance the question then becomes how much crop insurance do you have? In a closer look at crop insurance issues and the Farm Bill, Gene Lucht reported yesterday at Iowa Farmer Today Online that, “Ever so gradually, crop insurance has become the centerpiece of risk management for farmers. The article indicated that, “Crop insurance industry leaders are hopeful, but wary of the upcoming debate. “‘There are obviously many moving parts in the 2012 farm-bill process, so speculation is premature,’ says Tom Zacharias, president of National Crop Insurance Services. (Note, for example, these bi-partisan comments from lawmakers in support of crop insurance that were made at last week’s Senate Agriculture Committee Farm Bill hearing). Mr. Lucht stated in his article from yesterday that, “Crop insurance industry leaders remind lawmakers they already have seen cuts in the way the government compensates them. “‘Having already sustained $12 billion in budget cuts for deficit reduction, decreased funding is a major concern to the industry and to the farmers who rely on crop insurance,’ says Zacharias. “‘We don’t know what will happen,’ says Rep. Leonard Boswell, D-Iowa. Senate Agriculture Committee Chairwoman Debbie Stabenow (D., Mich.) recently addressed the Crop Insurance and Reinsurance Bureau annual meeting. Her remarks, which included comments on farm policy and crop insurance, were made via a video address; a replay of the Chairwoman’s comments has been posted at Agri-Pulse Online. The opinion column proceeded to develop a satirical set of hypothetical scenarios illustrating the potential inane results of implementing such an idea. Meanwhile, a news release yesterday from the International Dairy Foods Association (IDFA) noted in part that, “Michael Scuse, acting under secretary for Farm and Foreign Agricultural Services for the U.S. Department of Agriculture, kicked off the program [the International Sweetener Colloquium that took place on February 12-15 in Orlando] with a keynote address. He outlined the actions USDA has taken to make up for shortfalls in domestic sugar supplies. He also emphasized the need for continued transparency in the administration of the U.S. sugar program, which falls to USDA under the Farm Bill. Scuse and his department are responsible for implementing provisions of the federal sugar program. And in other policy news, the AP reported yesterday that, “Consumers at Connecticut grocery stores would be able to know if genetically engineered foods are in the merchandise mix under a bill state lawmakers are considering to require the labeling of such foods. “Neither the federal government nor any state currently has a labeling requirement that applies to all genetically modified foods. Connecticut is among nearly 20 states considering a labeling mandate amid health concerns that supporters of the legislation have raised about such foods. And Bloomberg writer Jack Kaskey reported yesterday that, “Seed companies including Monsanto Co., the world’s largest, will get speedier regulatory reviews of their genetically modified crops under forthcoming rule changes, the U.S. Department of Agriculture said. Bloomberg Alan Bjerga reported yesterday that, “Low interest rates and surging agricultural income have helped send U.S. farmland prices to a record, a government report showed. Reuters writer Doug Palmer reported yesterday that, “The United States said on Wednesday it was still considering whether to support Japan’s bid to join talks on a trans-Pacific regional free trade agreement, three months after Tokyo announced interest in the negotiations. “‘Both governments agreed to continue the consultative process, with additional meetings to be arranged at a later date,’ the office of the U.S. Trade Representative said in a statement after two days of talks with Japanese officials. The “Washington Insider” section of DTN reported yesterday (link requires subscription) that, “Grain farmers in Canada’s main corn- and soybean-producing province of Ontario say they support plans by the federal government to join the ongoing negotiations aimed at bringing about a Trans-Pacific Partnership trade agreement. But they also want to make sure Japan, which is not among the partnership’s current signatories, comes to the table. “U.S. farmers, too, should be eager for Japan to participate in the talks since one of the main goals of the proposed agreement is to reduce tariffs and thus increase trade. Julie Steinberg, Aaron Lucchetti and Mike Spector reported in today’s Wall Street Journal that, “Investigators probing the collapse of MF Global Holdings Ltd. are scrutinizing two money transfers made during the securities firm’s final days in an effort to uncover what happened to $1.6 billion in missing customer funds. 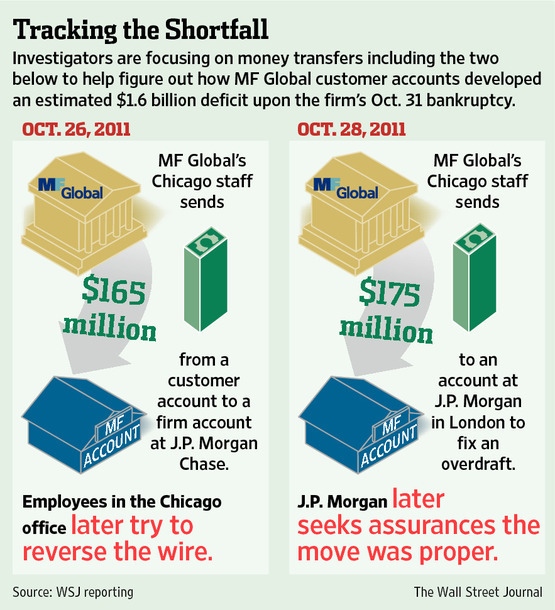 The in-depth Journal article also included this graphic illustration highlighting the two transactions at MF Global. Reuters writer Tom Polansek reported earlier this week that, “With the tax man breathing down his neck, Ohio farmer Tony Rohrs is scrambling to figure out how much money he made last year in an account at MF Global.